The Special Olympics Healthy Athletes program is designed to help Special Olympics athletes improve their health and fitness. The ultimate goal of Healthy Athletes is to improve each athlete’s ability to train and compete in Special Olympics as well as in life. Health screenings are conducted at Nebraska competitions as well as World Games and National Games. 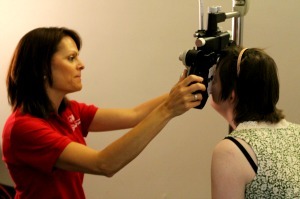 Healthy Athletes screenings have provided free care to hundreds of thousands of Special Olympics athletes. All Healthy Athletes screening areas maintain confidentiality of each athlete’s health information. The screening data are aggregated and assessed to improve individual athlete health, and to assist in policy recommendations and advocacy for improved health care for Special Olympics athletes around the world. The Healthy Athletes initiative is supported in part through a cooperative agreement with the U.S. Centers for Disease Control and Prevention, a grant from Lions Clubs International, generous support from health related organizations and local corporate sponsors and most importantly, volunteer services from thousands of health care professionals and students.